Collaborating in Revit is better than ever. Your company can gain better insight into spatial relationships and change management using an all Revit Workflow. 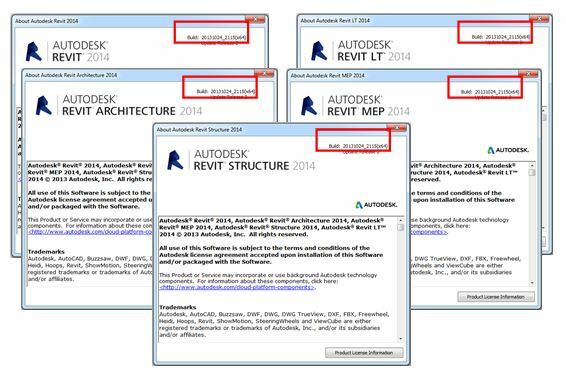 Prior to release 2013, Revit was offered as three separate discipline-specific verticals. The 2013 release offered us a single product in the Building Design Suite Premium and Ultimate packages. 2013 also introduced us to Revit LT.
Each project team MUST be working on the same platform (i.e. 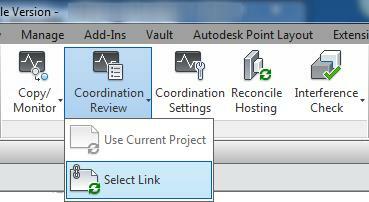 Release) to properly open and link one another’s Revit project files. 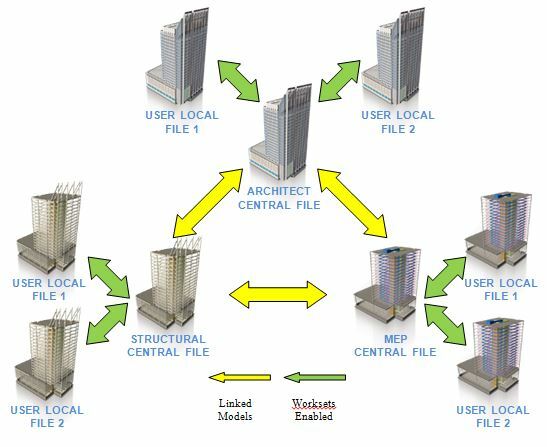 The coordination between models using Revit’s Coordination Monitor and Interference Check tools will provide immediate visual feedback on differences and clashes between the host and linked model elements. NOTE: Not applicable to Revit LT. Viewing linked models in full context of your own project. Graphically controlling linked model elements. Clashing categories of elements between host and linked models. The Coordination Monitor is a feature that allows elements in a host file to monitor change in companion elements in a linked file. NOTE: Not applicable to Revit LT. Choosing standard elements (i.e. Levels, Grids, Walls, and Floors) in the host and linked models to monitor one another for change. Choosing standard elements (i.e. Levels, Grids, Walls, and Floors) in the linked model to be copied into the host model for monitoring change. Batch copy/monitor equipment and device elements in the linked model to the host model. This feature also allows type-mapping of companion families found in each file. NOTE: Not applicable to Revit Architecture and Structure. The Interference Check is a feature that allows categories between a host and linked model to be clash tested against one another. NOTE: Not applicable to Revit LT. The ability to check interferences within the host project. The ability to check interferences between host and linked models. Effective collaboration can be achieved in a single model environment. However, it is recommended that the models be separated from one another to gain performance from your hardware. Architect/Structural Engineer: In this relationship, the structural engineer will link the architect’s model and use Copy/Monitor to copy or monitor elements in between models for change management. The architect will link the structural engineer’s model and use Interference Check to verify that the architectural elements are not conflicting with structural elements. Architect/MEP Engineer: In this relationship, the MEP engineer will link the architect’s model and use Copy/Monitor to copy or monitor elements between models for change management. The architect will link the MEP engineer’s model and use Interference check to verify that architectural elements are not conflicting with MEP elements. Structural Engineer/MEP Engineer: In this relationship, both parties will link each other’s models together and use Interference check to clashes between structural, mechanical, electrical, and plumbing systems. Based on the recommendations above, this diagram represents a suggested use of Revit’s collaboration tools between each program/discipline. On larger projects, the MEP models could be separate models linked together to enhance performance. Use the Coordination Monitor when necessary. Overuse of Coordination Monitor could slow the linked model’s performance. Some relationships need only to be set up as a monitor not a copy/monitor. Monitoring of elements can be stopped at the user’s discretion. When Worksets are enabled be sure to follow the recommendations below. Coordination Monitor should be set up Central File to Central File. All updates want to occur when the Local Files are not being used. Open the consultants Central File using the Detach from Central setting to detach it from the consultant’s local area network. Then, perform a Save to remake the consultant’s Central File on your local area network. Link the newly saved Central File from the consultant to your Central File. 1. The architect will send the architectural model to the structural engineer. 2. The structural engineer opens the delivered model and reviews its elements. Levels: Do they make sense for use in the structural model? Do the bubbles vary from the company standard? Grids: Do the bubbles vary from the company standard? Columns: What type of columns are available? Are the columns continuous or split? Walls: Are there structural walls needed in this project? What kind of walls were used? Floors: What kind of floors were used? 3. The structural engineer starts a new project. 4. The architectural model is linked in. This is accomplished by Insert Tab>Link Panel>Link Revit. 5. Use the Auto – Origin to Origin positioning by default or, use Auto – Shared Coordinates if shared coordinates are being utilized project wide. 6. The structural engineer selects Collaborate Tab>Coordinate Panel, Copy/Monitor>Select Link and then selects the architectural model. 7. The Ribbon changes to reveal the Copy/Monitor tools. 8. The Options button is accessed to reveal the Copy/Monitor options for Levels, Grids, Columns, Walls, and Floors. 9. The structural engineer monitors or copy/monitors elements of the architectural model required to begin and coordinate the structural model. 10.The structural model will continue being developed. 1. The architect will send the architectural model to the MEP engineer. 2. The MEP engineer opens the delivered model and reviews its elements. Levels: Are necessary for proper Space placement in the MEP model? Do the bubbles vary from the company standard?? 3. The MEP engineer starts a new project. 9. The MEP engineer monitors or copy/monitors the levels first. 10. The Coordination Settings button is accessed to reveal equipment and devices to be Copy/Monitored. 11. The behavior assigned to equipment and device categories to be copied are specified using an individual or batch mode as well as, using an original or type-mapping preference. 12. The MEP engineer monitors or copy/monitors elements of the architectural model required to begin and coordinate the MEP model. NOTE: The Batch Copy option continually copies new equipment and device elements from the linked model when a companion in the MEP model does not exist. 13. The MEP model will continue being developed. 1. The structural engineer will send the structural model to the architect. 2. The structural model is linked in. This is accomplished by Insert Tab>Link Panel>Link Revit. 3. Use the Auto – Origin to Origin positioning by default or, use Auto – Shared Coordinates if shared coordinates are being utilized project wide. 4. The architect can run/use Interference Checker at this point, but might elect to monitor the levels and grids to access additional features of Coordination Monitor. 1. 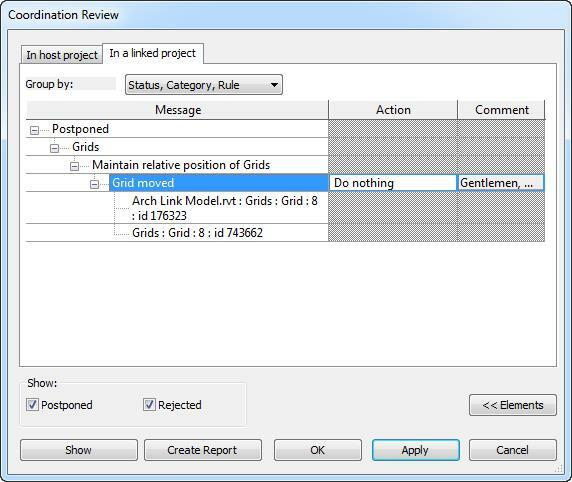 If the consulting engineer’s model sees monitored elements in the architectural model that have changed, Revit will display a Warning dialog about a Coordination issue. 2. The changes can be viewed through the Coordination Review Manager by Collaborate Tab>Coordinate Panel>Select Link. 3. Once the link is selected, the Coordination Review Manager will open displaying messages of coordination issues. The coordination issue can be conveyed as it pertains to the host project or the linked project. The issue can also be viewed by selecting the Show button. 4. The consulting engineer can see comments from the architect in the linked project tab. 5. The comment from the architect can be reviewed for further detail. 6. The consulting engineer could decide to postpone the action and comment within the host project tab for the same issue. The comment can then be reviewed on the architect’s end once the consulting engineer’s file is updated in architect’s project. NOTE: The architect must be monitoring the same elements the engineer is commenting on in order to view the comments made by the consulting engineer. 7. The consulting engineer’s model is saved and sent to the architect as an update. Postpone / Do Nothing: Leaves the change to be addressed at a later time. Reject: There is a difference in the host file and its associated monitored element. The change made to the element in the host file is incorrect and the associated monitored element needs to be changed. Accept Difference: Accepts the change made to the element and updates the new relationship. Modify, Rename, Move: The command name changes based on the action. The change is propagated to the host project clearing the queue. 1. The MEP Engineer will receive the new updated structural model. 2. The MEP Engineer will access Collaborate Tab>Coordinate Panel>Interference Check>Run Interference Check. 3. 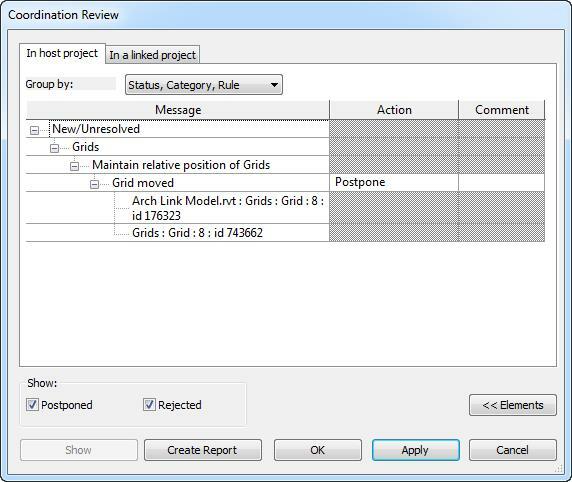 In the Interference Check dialog, the user can choose objects from the Current Project and compare them a linked project. 4. 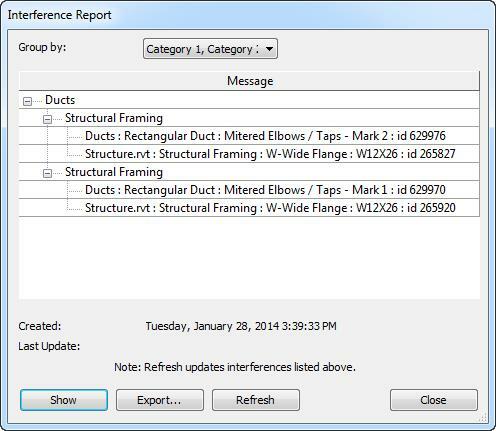 The Interference Report dialog will display all instances of conflict. From here, a report can be exported and the colliding elements can be viewed using the Show button. At this point, the MEP engineer can relocate their elements or collaborate with the structural engineer on framing changes. 5. If the MEP engineer relocates their conflicting elements, the Interference Check can be rerun by Collaborate Tab>Coordinate Panel>Interference Check>Run Last Report. 6. The previous clashes will display. However, selecting the Refresh button will run the test again. If the clashes are resolved in the MEP model, the Interference Report will be empty after the refresh. If the structural engineer receives the updated MEP model and runs a test on their own, they will see this message. This process continues over and over. Each discipline can function as a united team to deliver the full building information model. On larger projects, you can use the HTML reports that are generated to locate the various coordination issues. Each coordination and interference issue will provide Revit’s unique Element ID. Use the Manage Tab>Inquiry Panel>Select by ID command. In the Select Elements by ID dialog, enter the six-digit number and let Revit show where the element lives. This is also helpful when the ID’s come from reports generated by Navisworks Manage. Now, go out there and reduce the R.F.I.s and coordinate before it gets built.